Thermochronometric data record the rate at which rock approaches Earth’s surface (exhumation rate), and provide unique constraints on the coupled orogenic-surface processes dynamical system. In many mountain belts, thousands of ages have been collected over the last three decades providing an exciting opportunity to image geodynamics through time. For example, in the Alps 2500 thermochronometric ages have been collected during the past three decades constraining tectonic and geodynamic and events over the last ~35 Ma of collisional history. However, extracting exhumation rates in space and time from large datasets has proven challenging primarily due to the disparate temperature sensitivity of different thermochronometric systems, geomorphic noise, and the need to estimate the thermal structure of the crust below a range of topographic wavelengths. Therefore, we recently developed a new linear inversion method to exploit thermochronometric datasets (Fox et al., 2013). Our analysis revealed a complex exhumation function, in which rates vary due to changes in tectonics, climate and mantle dynamics (Fox et al., 2016). A striking feature of the exhumation function appears in the Western Alps where exhumation rates increase dramatically at ~2 Ma to greater than ~1 km/Myr. The limited spatial extent correlates with the location of proposed slab detachment below the Western Alps, which would lead to increased rock uplift through isostatic readjustment to removal of this negative load. However, the lack of a clear topographic signal of increased rock uplift indicates that the processes of glacial erosion have increased in response to rock uplift (Fox et al., 2015). Left panels show estimated exhumation rates for the European Alps from inverting thousands of thermochronometric ages. The right panels show an estimate of the resolution of the model parameters. It is also possible to infer tectonic processes from the shape of river networks and the steepness of river channels. The shape of river networks can be quantified with a range of metrics, however, an integral expression, termed chi, has proven to be particularly useful. Local changes in chi across drainage divides imply that drainage networks are evolving through drainage divide migration and piracy of channel heads. Systematic changes in chi can also be indicative of large scale variations in tectonic processes driving topographic development. Using similar inverse methods to those we developed to extract exhumation rates from thermochronometry, we can use an analytical expression of the commonly used stream power model to invert fluvial topography for uplift history. In Goren et al., (JGR: Earth Surface, 2014), we applied a simplified approach to the Inyo Mountain Range, CA, which allowed us to constrain fault slip rates on the Eastern California Shear Zone. In Fox et al., (JGR: Earth Surface 2014), we constrained rock uplift history as a function of space and time across the mountains of Taiwan. The presence of residuals between model-predicted and observed elevations, and residuals related to erosion rate, suggest the need to incorporate additional factors in our analysis. These complexities include lithological controls on erosion rate, dynamic drainage area reconfiguration and changes in climate. These complexities can potentially be accounted for using non-linear inverse methods, similar to those we employed in the Central Andean Plateau (Fox et al., JGR: Earth Surface, 2015), which would allow drainage networks to evolve through time. At present, I have integrated landscape evolution models with the interpretation of topography in the Alps and the Himalayas and Tibet. The river network of Taiwan can be used to infer rock uplift rates. Here are model residuals for a catchment in Taiwan showing that drainage basins that are actively losing drainage area, e.g., the blue tributary, are easily identified in the results. Some of Earth's most iconic features are large valleys that have been eroded by ice and water. However, quantifying the rates and processes responsible for these landscapes can be challenging. Low temperature thermochronomety provides a means to measure the rates at which rocks at the base of these valleys approaches Earth's surface due to incision. In particular, 4He/3He thermochronometry is sensitive very low temperatures of 30-80 ° C which corresponds to depths of 1 to 2 km. We have been applying this approach to some of the most dramatic valleys on Earth and have exciting results from Grand Canyon, Yosemite Valley and the Cotahuasi Canyon. This approach requires collecting bedrock samples from the base of the valleys and comparing the resulting thermal histories with thermal histories from rocks at the top of the valleys. These results can then be used to calibrate the rates of landscape evolution. A nice view of Grand Canyon. 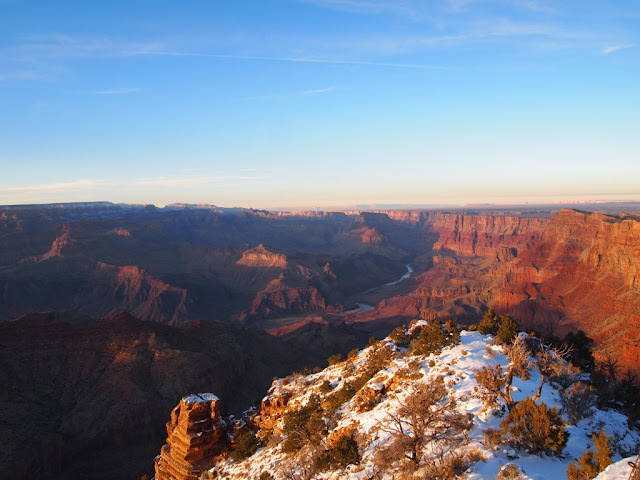 Our data indicate that Grand Canyon has been incised within the last 6 Ma. In some cases, the bedrock is inaccessible and thus the approach described above is not very useful. In other cases, a handful of bedrock samples (and in situ cooling histories) may not be sufficient to capture the complex spatial variations in landscape evolution. A solution to these problems is to use detrital thermochronometry. This approach relies on the processes of erosion and sediment transport to deliver sand to the outlet of catchments, where it can be sampled. The distribution of detrital thermochronometric ages in this sample is a function of the distribution of bedrock ages in the catchment and the spatial distribution of modern erosion rates. We have been using this approach to understand the distribution of modern erosion rates in the European Alps (Fox et al., 2015) to investigate the formation of inner gorges. We have also been using this approach along the Antarctic Peninsula to get an idea of the bedrock age distribution and also see how glaciers are eroding the deep fjords found there. 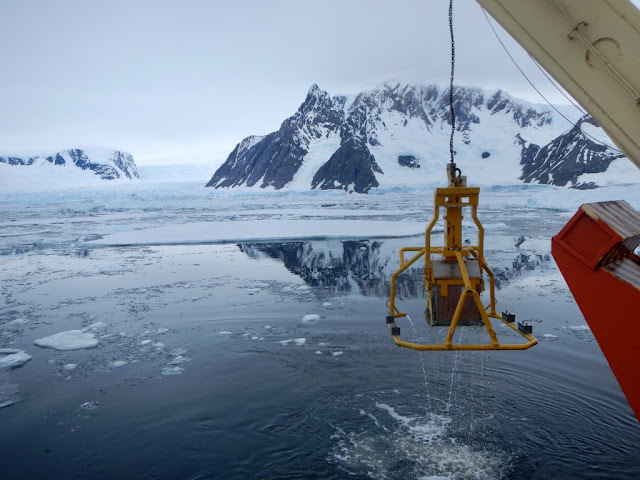 Here, we use a boxcore to sample material from the seafloor close to the calving front of major glaciers. The boxcore collecting a seafloor sample close to Neny Glacier from the back of the Laurence M. Gould in 2017. The U-Th/He system is sensitive to very low temperatures (<100 °C), and thus provides unique constraints on thermal histories of rocks in slowly eroding landscapes. In these scenarios, however, overdispersion of (U-Th)/He ages represents a major obstacle when extracting accurate and precise thermal histories. Two major, and related, sources of overdispersion are: the effects of radiation damage accumulation on the diffusion kinetics of helium; and variations in the concentration of parent isotopes, either within individual crystals or within multi-crystal datasets. As an alternative to collecting multiple crystal ages from the same sample is to collect a large amount of information from one or two crystals using 4He/3He thermochronometry. Using step-wise degassing of radiogenic 4He and artificially proton-induced 3He, the spatial distribution of 4He can be measured. This distribution is a function of both the thermal history of the sample and the spatial distribution of the parent isotopes. In some cases, this spatial distribution of parent isotopes dominates the release spectra and must be accounted for to extract meaningful thermal histories. We have been working on two ways to accurately infer time temperature paths from samples where this is important. Ultimately, these approaches will extend the areas where this approach can successfully be applied to areas of slow erosion, such as passive margins. First, we can measure the spatial distribution of parent isotopes using Laser Ablation ICP-MS analysis of polished sections through crystals. This approach provides a 2D representation of the parent isotope distribution. However, in order to accurately measure isotope concentrations, a relatively large ablation spot is required. This effectively smears zonation information and decreases the rate of change of concentration gradients in analyses. Therefore, we have been working on ways to deconvolve this smearing and recover sharp zonation gradients. Our approach is based on the discretization of space into pixels. Overlapping ablation spots will sample the same pixels, but the concentrations measured could be different due to spatial averaging. By setting up this problem as a linear system of equations with spatial smoothness constraints, we can solve for the true underlying pixel concentrations. This results in a map of concentration that is of higher resolution than the ablation spot size and this has important implications for other datasets collected with LA-ICP-MS (Fox et al., in review). Second, numerical models that account for spatial variations in parent isotopes are required. This is because parent isotopes control where helium is produced within the crystal and also because different parts of the crystal evolve different diffusion kinetics due to radiation damage and annealing. In some cases it is possible to collapse 2D zonation information obtained from LA-ICP-MS into 1D radially symmetric models, however this represents another source of spatial averaging and smoothing. Therefore, we developed a 3D model to solve the helium diffusion equation accounting for variable diffusion kinetics within the crystal. This can be challenging because the diffusivity can vary by several orders of magnitude within a single time step due to spatial variations in radiation damage. To account for this challenge and ensure that simulations are sufficiently fast to be used in inverse problems, we used a multigrid method to solve the diffusion equation. We have applied this code to apatite crystals from the Appalachians Mountains (Fox et al., 2014) to understand dynamic topography and the Sierra Nevada (Tripathy-Lang et al., 2015). Results of a numerical model of helium diffusion in a single apatite crystal. The in situ U-Th/He age is very variable due to spatial variations in diffusion.